"Recent storms, which locals say was the worst in 25 years, resulted in old growth trees falling across the track and makeshift bridges washed away." The Kokoda Track is being cleared and repaired in preparation for the 2019 trekking season this month. Recent storms, which locals say was the worst in 25 years, resulted in old growth trees falling across the track and makeshift bridges washed away. Maintenance and bridge upgrade work began on the 96-kilometre track on 29 March. Repair teams are being conducted under the leadership of the Kokoda Track Authority with support from the Australian Government, and include local rangers and men and women from Kokoda Track villages. KTA Chief Executive Officer Julius Wargirai welcomed the specialist assistance and logistical support provided by the Australian Government and the building of local skills. “Through this support, local rangers and villagers will be able to earn income and learn the practical skills needed to maintain accessibility of the track for both trekkers and locals. 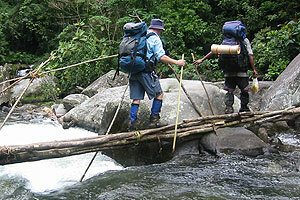 We are also keen to build bridges that can better withstand the impact of future wet season events,” he said. With the 2019 trekking season officially starting this month, maintenance of the track is needed to ensure the safe passage of around 3,500 trekkers a year. The track will also be made safe for local villagers who use the bush path to travel between the 91 communities from Kokoda Station in Oro Province to Sogeri in Central Province. Bradley Bana from Efogi village said he was proud to be part of the team and to repair the nearby Eora Creek Bridge which was washed away in recent storms.